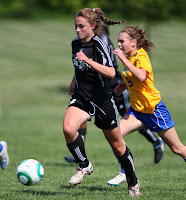 CHICAGO (May 17, 2013) – Eclipse Select Soccer Club NWI forward Paige Aguilera (Crown Point, Ind.) has thrived as a predominantly left-footed player on the pitch, and Wright State is looking to take advantage of that element. Aguilera is committed to play for the Horizon League squad starting this fall, and she certainly hopes to make an immediate impact. Aguilera is certainly amped up about the next chapter in her career. “I can’t be more excited,” Aguilera said. “Ever since I was younger, I’ve always wanted this, and to get there to train for my first college game is a great feeling. It’s everything I’ve worked for. CHICAGO (May 10, 2013) – Eclipse Select Soccer Club goalkeeper Rachel Gerhardt (Valparaiso, Ind.) has reaped the benefits of her hard work both on and off the field, and at just 17 years old she will take her game to the college level with Valparaiso starting this fall. After three full school years, the Eclipse Select U-18 NWI net minder will graduate from Boone Grove High School and compete for the Crusaders in the Horizon League. Gerhardt had mostly been targeted by Division II and Division III programs throughout the country, but the stars aligned for the Valparaiso, Ind., native to compete for a Division I institution in her hometown. She joins a Valpo program led by head coach John Marovich. CHICAGO (May 4, 2013) – Eclipse Select Soccer Club forward Sydney McGinnis was recognized by Wisconsin women’s soccer coach Paula Wilkins when she was 9 years old. The combination of that familiarity and McGinnis’ drive to return from a year and a half injury are just two reasons why the Park Ridge native and Maine South junior stayed on the radar will be playing for the Badgers starting in the fall of 2014. McGinnis’ ACL injury was 17 months ago, and this weekend marks her return to the pitch. Eclipse Select’s U-17 Elite Clubs National League team has an inner-club scrimmage this Sunday.